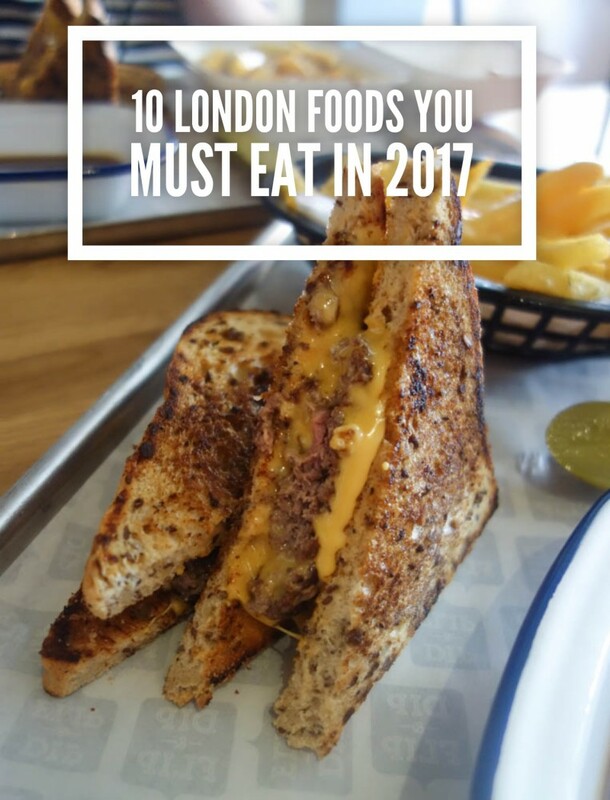 2016 brought some amazing food to the London restaurant scene and if you don’t eat anything else in London ever again, here are 10 amazing meals you need to eat in 2017. 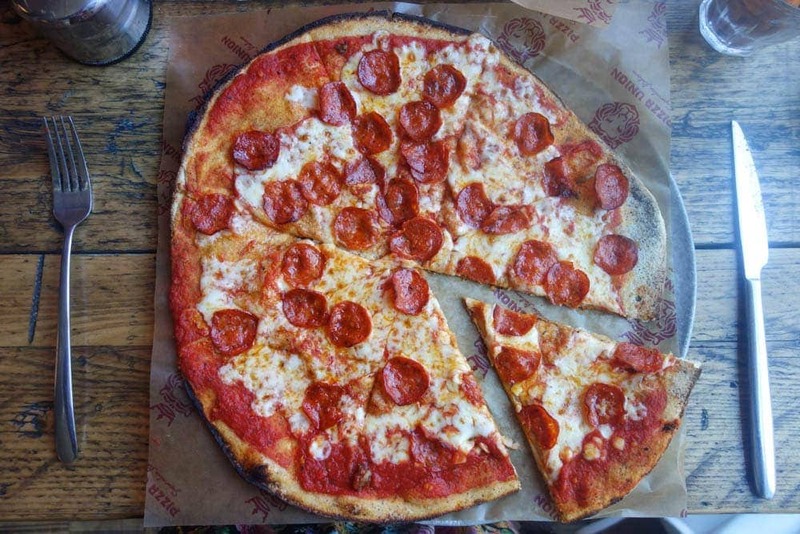 Not only is Pizza Union’s double pepperoni pizza ABSOLUTELY delicious but at just £5.95 it’s an absolute steal. It’s thin, crispy and at a pretty sizeable 12 inches, it’s definitely one the London’s best cheap eats around! 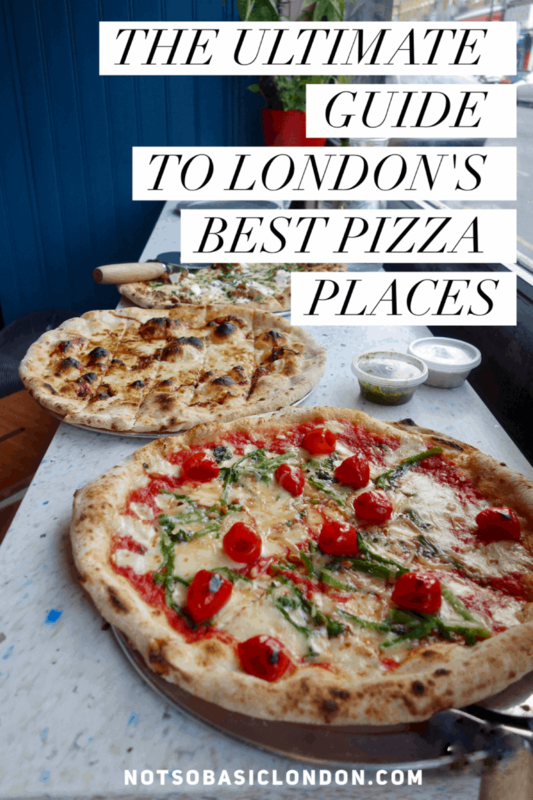 Their garlic sauce is highly recommended for crust dunking too. More on pizza union here. Think of the best sandwich and burger you’ve ever eaten, put them together and times it by 10. That’s how good the patty melt is. 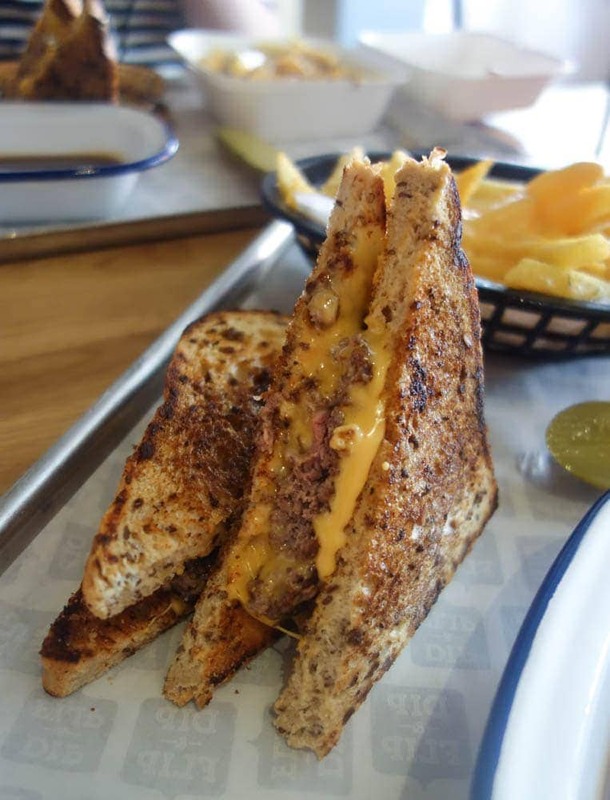 Between 2 pieces of toasted, buttery, malted bread is a crushed burger, stuffed with sweet, caramelised onions and squirty, fake cheese. As with everything in Dip and Flip, it comes with its own pot of gravy for dipping too. Full post here. 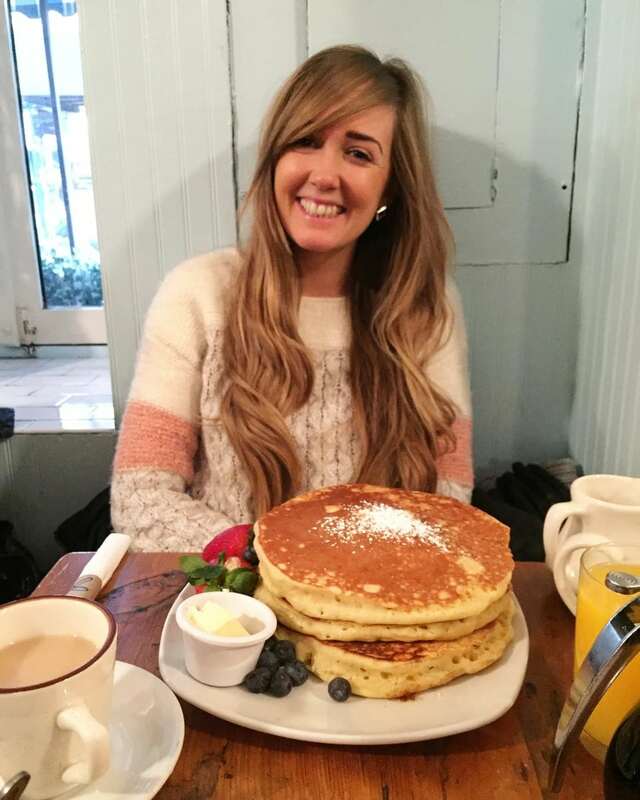 Many places in London do American pancakes but not many do them as authentic and delicious as Outsider Tart. 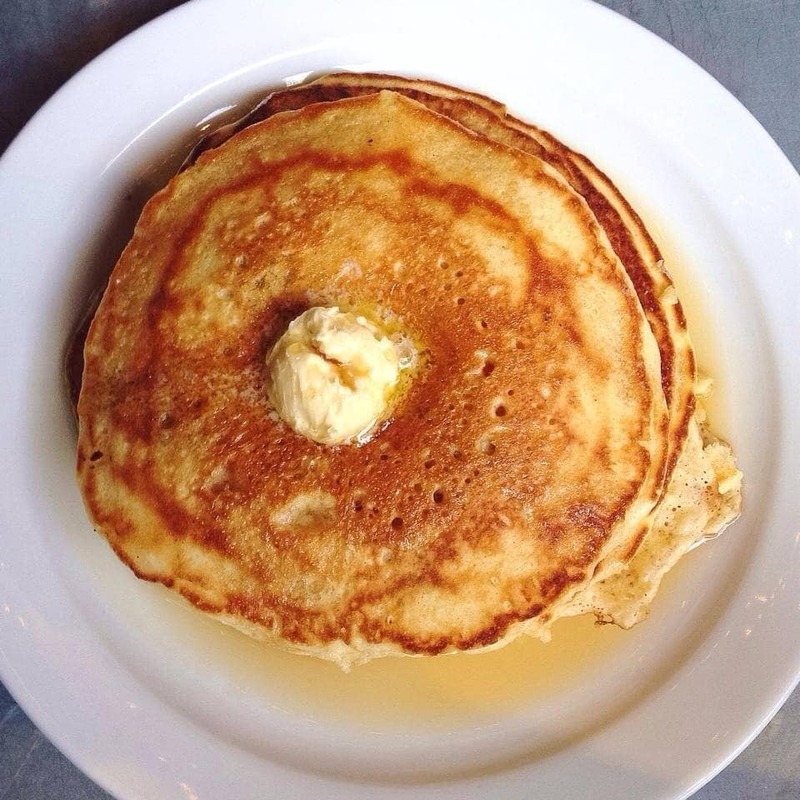 They’re served fat, fluffy, and covered in butter and real maple syrup; not to mention they’re the size of a dinner plate. They come in stacks of 2 (short), 3 (regular) or 4 (long haul) and you’ll definitely want four once you’ve tasted one. Whether your waistband can manage them is another thing. The London drink taking the internet by storm. 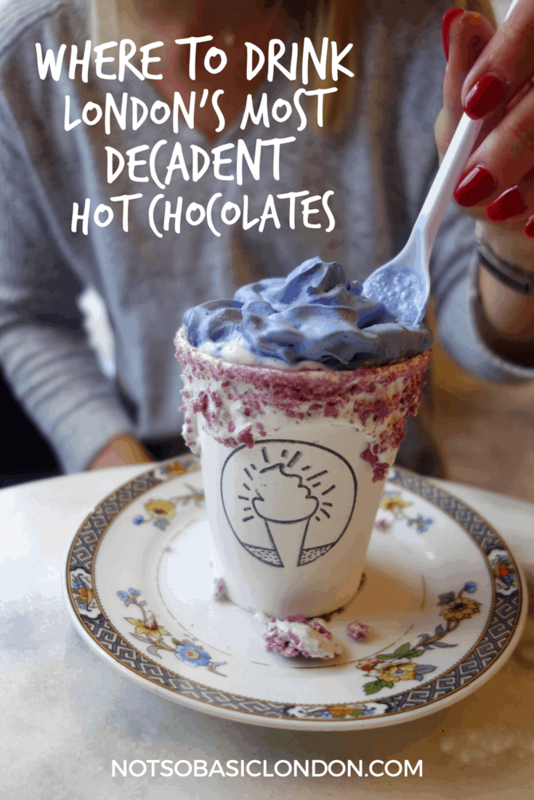 Thick, hot, steaming drinking chocolate topped with a layer of toasted marshmallow fluff so thick the spoon gets stuck. Find it at Camden Market. Click to play the video below. Egg and soldiers are taken to a whole new level at Duck and Waffle. 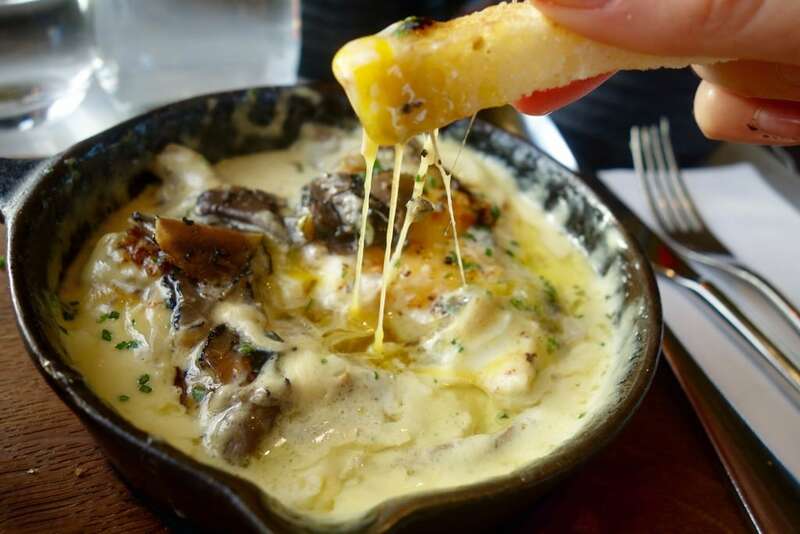 Two runny eggs are baked in gruyere cheese, double cream, mushrooms and truffle oil. Comes with bread for dipping for too! One of richest breakfasts you’ll probably ever eat, not to mention with a bloody amazing view to go with it. Loads more on Duck and Waffle here. Sticky toffee pudding is probably THE dessert of all desserts. 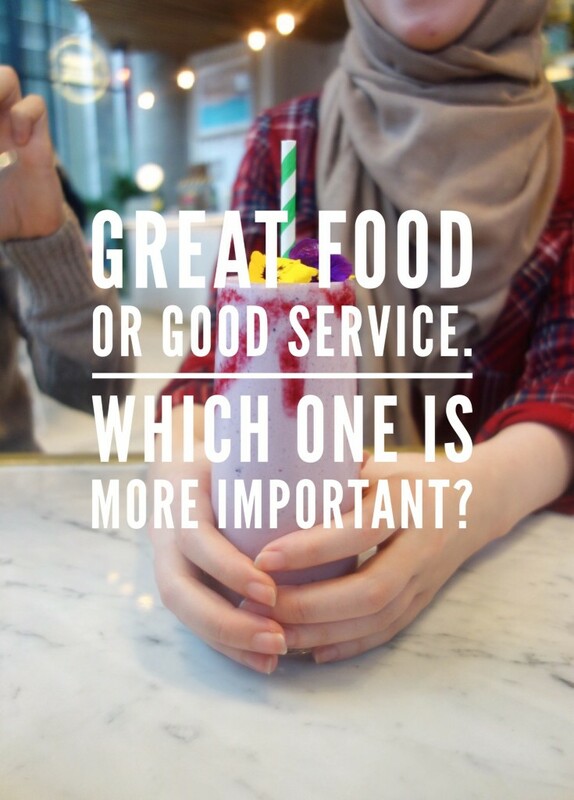 Chocolate purists may disagree but until you’ve had this one from Temple and Sons don’t make a decision just yet. Soft, syrupy sponge with salted caramel ice-cream and slathered in a hot sticky toffee sauce. 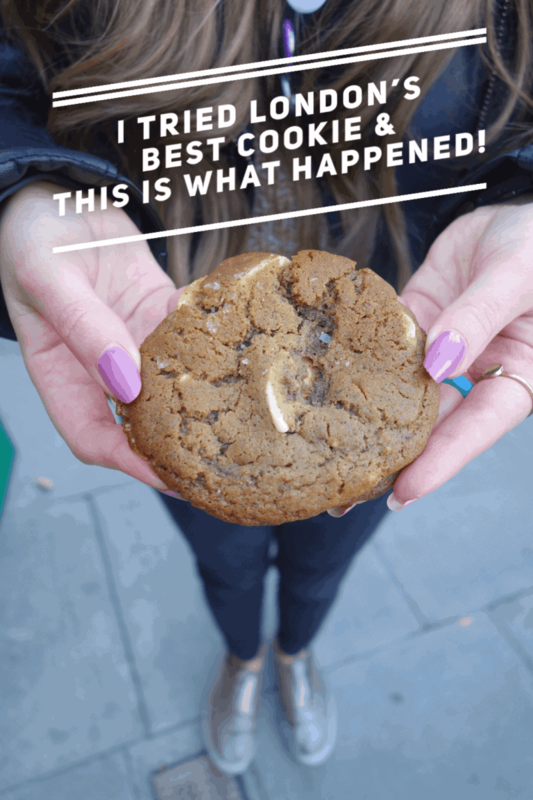 It’s so sweet, warm and comforting and will put you in a sugary coma that is well worth it. Sorry chocolate pudding lovers, this one trumps all. Click to play the video below. 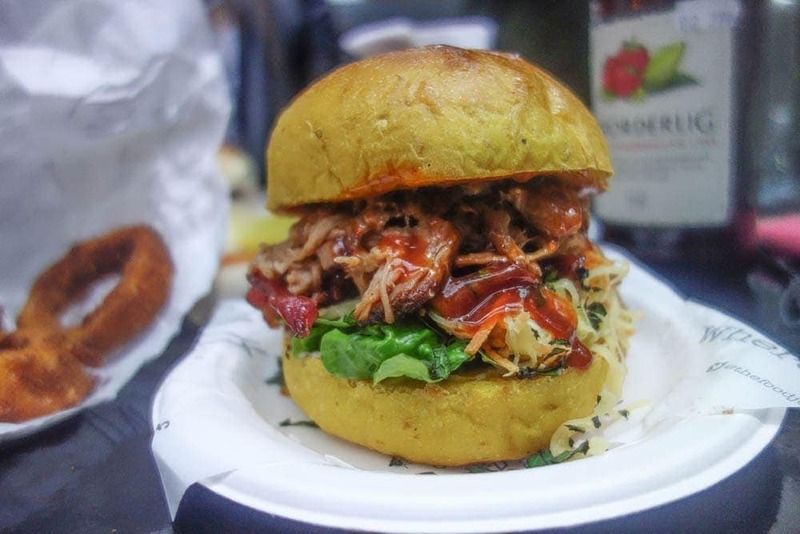 If you’re a fan of pulled pork than this burger in Brixton is one you need to try. The 16 hour slow cooked BBQ’d meat is piled high in a yellow bun and topped with candied bacon, slaw, and even more BBQ sauce. It’s juicy, meaty, and melts in your mouth. 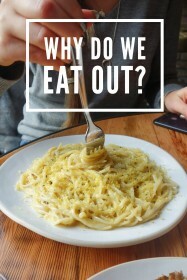 Go with someone you don’t mind seeing you with sauce all over your face! In the centre of Spitalfields market is Androuet; a cheese filled restaurant with wooden tables, blankets to keep warm, and loads of carbs. 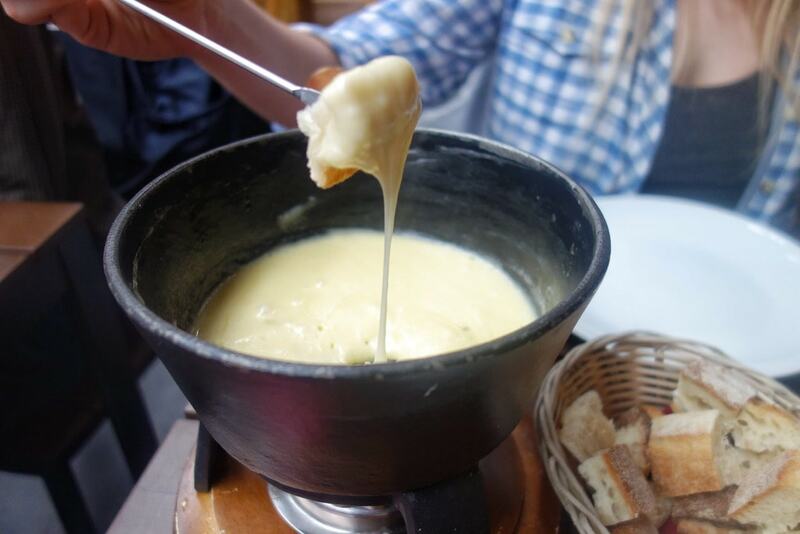 Their fondue is a mixture of three hot, molten cheeses and is served with bread, potatoes and truffle honey for dunking! A cold weekend calls for this cheesy, decadent dinner! Full post on Androuet right here. 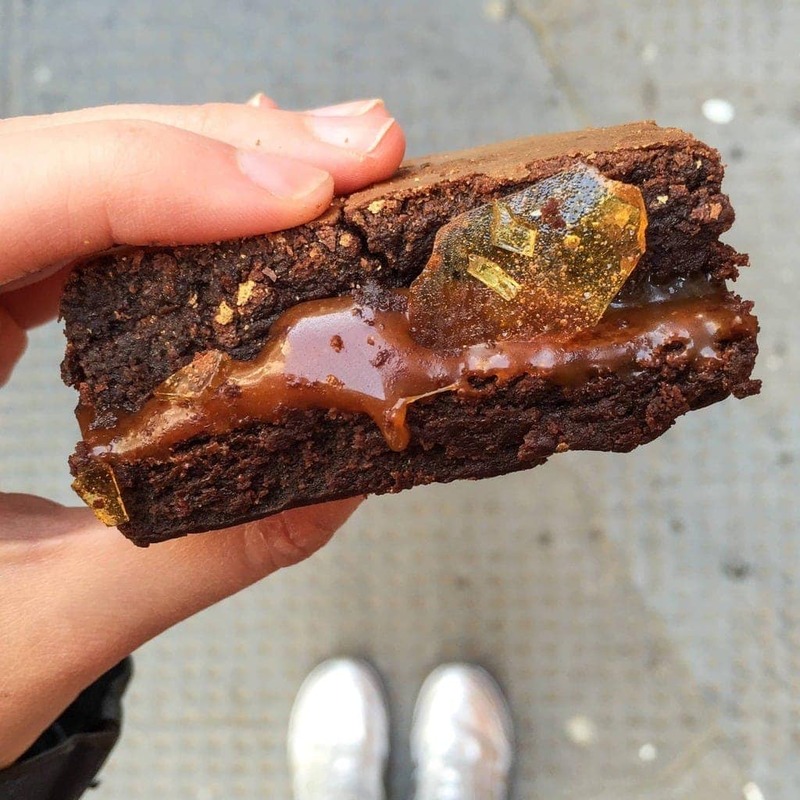 Bad Brownie’s brownie is fudgy, gooey, squidgy and bursting with the golden salty caramel. It’s everything you want and need in a brownie and these guys know what they’re doing. If salted caramels not your thing, (doubtful) the jaffa cake one is recommended too. Can be found at most good London food markets. The chicken at Chicken Shop is very good, but the apple pie is mind-blowing. It’s brought to your table in the dish it’s been baked in and scooped out into your bowl in one big, fat spoonful. 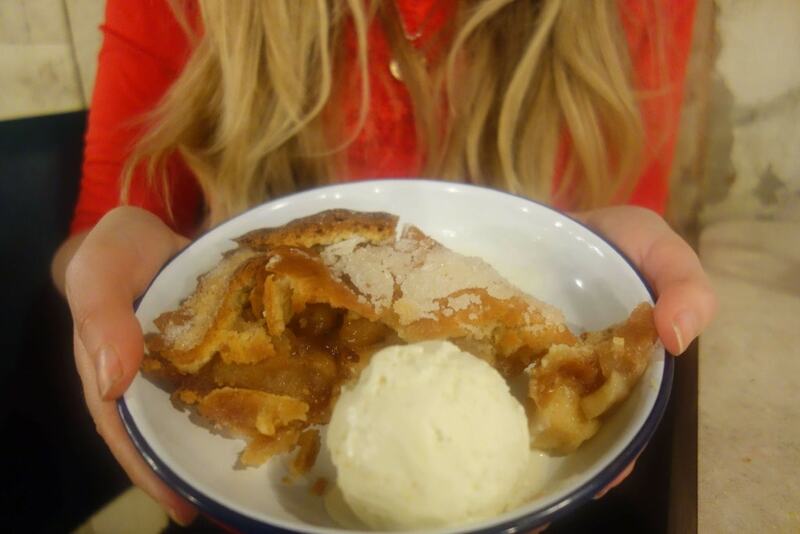 The crust melts in your mouth and the soft apple centre is packed with cinnamon and sugar. If you go here for dinner make sure you end on an apple pie high. More on Chicken Shop can be found here.